Save The Ribble: New Floating Homes Development to include Watersports - But Will the Ribble be Safe? New Floating Homes Development to include Watersports - But Will the Ribble be Safe? 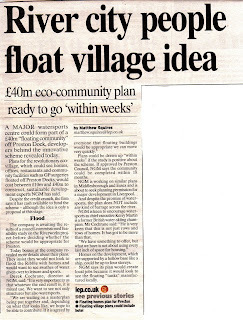 The Lancashire Evening Post today report that the "floating homes" development recently proposed for the Docks and River 'does NOT include any kind of barrage across the river' BUT WILL include 'swathes of water given over to leisure and sports'. - both of which are a tad ambiguous as neither appear to suggest that they intend to leave the River Ribble out of the scheme altogether. -What does "off" the Dock mean? ON the Dock - or near the Dock? -Are these "swathes of water" also looking at the River or just the Docks? -DO these proposals include the River or not? Whilst we welcome the idea that the proposals for the Docks include leisure facilities instead of just new houses, it is important to know just what the impact will be on the River Ribble and its environs. We of course welcome boat-users on the River - but we would also like to see speed restrictions imposed on the River Ribble above Penwortham New Bridge as speedboats and jetskis this far upriver are intrusive and damaging to the banksides, and disruptive to birdlife and the ambience of the river environment. In the meantime, you can catch up with more of the latest Ribble news about how Local Councillors adopt local residents' proposals for the River whilst warning that developments may still threaten the Ribble. I have experienced the problems encountered in the oxygenation required to allow water sports to be undertaken to the Manchester Ship Canal first hand. It incurs great expense and creates artificial environments which rely on the Oxygenation to continue to exist. Not only is such intereference harmful to local natural eco-systems but the production and importing of the Oxygen is also harmful to the wider environment. Such a proposal for Preston I would suspect, has the same requirements. I do find such pie in the sky and ill thought out proposals with a simple aim of making a short term commercial gain for the proposers rather wearisome. The focus for the docklands and upriver must surely now be upon creating something that is truly sustainable for the benefit of all. yes indeed - the blue-green algae in the Docks has been a real problem for many years, and of course will prevent any such watersports schemes from going ahead anyway, until they attempt to "solve" the algae with an oxygenation scheme which will not only have the impacts you mention but will be exhorbitantly expensive too, particularly as it will have to run indefinately.